Firstly the aim for treatment is to reduce the severe excessive inflammation that is responsible for the life-threatening symptoms. Secondly, treatment aims to kill any of the immune cells that have been infected by a trigger, for example viruses and bacteria. This aims to remove the trigger for the excessive inflammation. Unfortunately, even if the original infection that triggered the HLH is killed, that is not enough to stop the excessive inflammation, since it has spiralled out of control. Thirdly, the ultimate aim for children with a genetic cause of HLH is stem cell transplantation. This aims to replace the defective cells in the bone marrow, with healthy cells from a donor. The priority of treatment is to damp down (suppress) the immune system to reduce the over-reaction and lessen the risk of tissue damage. This will often involve courses of corticosteroids and chemotherapy medicines, usually given into a vein (intravenously) in hospital. Some of the medicines used are listed in the table below but new treatments are being developed all the time. Treatment will be individualized to minimise side effects, which your medical team will discuss with you. If an infectious trigger is suspected, anti-infection treatment may be given, such as antibiotics or other medication. he symptoms, the age of the patient, and any other underlying conditions. 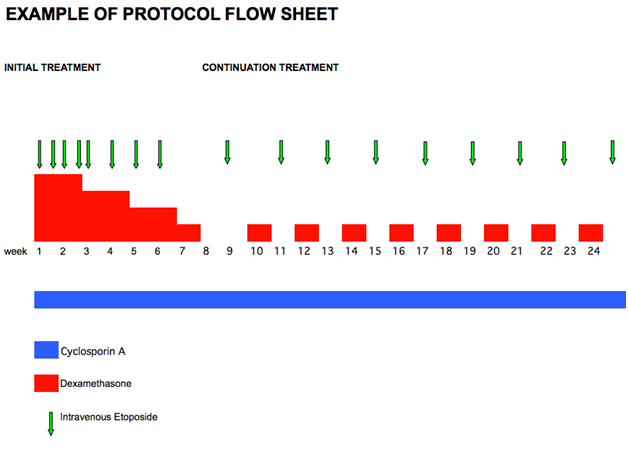 The vast majority of children with HLH will be treated with chemotherapy and immunotherapy guided by an international protocol (see example below), which maps out the dates for the different medications. The protocol will be tailored to your child. If your child needs chemotherapy, he or she will probably need a central line. This is a tube that is inserted into a large blood vessel and tunnelled under the skin to where it can be easily accessed. It allows blood samples to be taken and treatment, including chemotherapy, to be given easily and painlessly. The central line is put in under general anaesthesia and will stay in place until the end of your child’s treatment. Your hospital will provide more information about the types of central lines they offer. If your child is unwell or requires more intensive treatment he or she will need to be in hospital. Some children however receive some of their intravenous treatment by visiting their hospital out-patient or day-care facility. This may only be available at your treating oncologist/haematologist’s hospital or at your local hospital under a shared care arrangement with a local doctor. Some treatment, like that taken by mouth, can be given at home. While on chemotherapy, for up to 6 months afterwards, and up to a year after a bone marrow transplant, your child will be susceptible to infections. This is known as being immunocompromised. If he or she develops a fever or becomes unwell you need to contact your treating team immediately for advice. Your child may need immediate hospital admission and treatment with antibiotics. •	Steroids – corticosteroids are a medicine used to reduce inflammation and stop the body’s immune system acting the wrong way. Your child may be given dexamethasone (a type of steroid) that is usually taken by mouth. •	Chemotherapy – this is used to destroy HLH cells and is usually given intravenously. This means that the chemotherapy medicine is diluted in fluid and given straight into a vein, via a drip. Occasionally some medicines may be taken by mouth. •	Immunosuppressant medications – these are drugs which suppress the abnormal immune response, for example cyclosporin. •	Stem Cell Transplant (also called a bone marrow transplant) – this involves replacing the diseased cells in the bone marrow with healthy cells from a donor. Bone marrow is a spongy material found in the hollow centre of some bones. It is important as it contains special cells known as stem cells, which repeatedly generate specialized cells that carry oxygen, fight infection and stop bleeding. Those children without disease in the central nervous system (CNS – brain and spinal cord) and mild symptoms may receive milder treatment. These children need to be followed carefully for signs of disease progression, and more intensive treatment started if present. Children with disease of the central nervous system (CNS – brain and spinal cord) receive additional intra-thecal (into the fluid surrounding the brain and spinal cord), chemotherapy or steroid. Your child will have had blood tests to monitor disease progression already, but after 6-8 weeks of treatment, your child will have further blood tests, and bone marrow examination to see if the HLH has resolved. If your child has acquired HLH that has resolved, they will then be followed up to check for possible relapse. Reactivation of HLH is a frequent problem, and may occur in the brain and spinal cord and usually requires more intensive treatment. If the acquired HLH persists or your child has familial HLH, they will need to continue this treatment until they can have a stem cell transplant. All cells in the body have specific markers on them, and to be a match for transplantation, the donor cells must match these markers. While finding a suitable donor, your child will continue the medication to keep the inflammation at bay. About a quarter of children who need stem cell transplantation do not reach it because their disease has progressed quickly and severely. For those children, in whom the HLH has not responded after the first 4 weeks of treatment, there are other treatment options with immunological drugs and further options that will be advised by your consultant. Stem cells are mainly present in the bone marrow (the cavity inside large bones) and are the origins of all the blood cells in the body. If these stem cells are defective, then all the blood cells that they produce will be the same. The white blood cells interact to form part of the immune system that protects against infection. Stem cell transplantation involves killing the child’s (host) defective stem cells using a specialised programme of chemotherapy so that the child can be given an injection of new donor stem cells. These donor stem cells will establish in the bone marrow so that they can produce new healthy blood cells. All cells in the body have a number of markers on them that vary between person to person. Before transplantation, the markers on the host’s cells must be matched to those on the donor cells. Matched donor stem cells from a sibling are more favourable with a greater probability of survival, than from a mismatched unrelated donor, or a non-sibling donor. However, as HLH can be a familial disease, siblings may not be suitable to be used as donors. Both HLH and some of the therapies used to treat it, affect the blood cells so that the numbers and function of platelets, and red and white blood cells are reduced. This means that your child may require supportive care with transfusions of blood products, including red blood cells and platelets while their counts are low and antibiotics to fight infection.